Ken Houston photo-ops in front of a tagged wall. Fourteen months ago, in January 2014, self-proclaimed “community advocate” and wanna-be Oakland Mayoral candidate Ken Houston addressed a roomful of business owners, mass transit corporate executives, high-ranking police officers, journalists and a sprinkling of local and state elected officials or their representatives, invited on behalf of the East Oakland Beautification Council, a community initiative developed under the auspices of the Turner Construction Group (on whose website the group’s minutes appear), a major developer whose past projects include the Fox Theater and the AirBART Connector – two of the most visible symbols of gentrification in Oakland. Houston told the group, which didn’t include any representatives from the muralist community, that he was in favor of adopting a restorative approach toward youth graffiti vandals. “Seeing graffiti as a issue that is better solved with positive than punitive measures, Houston is looking into incentive programs to channel young graffiti artists to use their talents to beautify the city and win prizes and recognition for themselves,” the Oakland Post reported. Almost a year and one-half later, following Houston’s failed Mayoral bid—he placed 8th in a field of 16, with just over a half-percent (0.51%) of all votes tallied—none of those incentive programs or prizes have materialized. During the campaign, Houston made graffiti removal his signature issue–he called himself “militant” on graffiti, and posed for many photo-ops in front of tagged walls wearing an orange safety vest. Recently, Houston has taken to making homemade videos and posting wacky social media messages claiming that murals don’t deter vandalism, even though such claims contradict the EOBC’s own arguments. For instance, the EOBC’s minutes from March 2014 explicitly stated, “When young people see the graffiti murals it speaks to them it also helps to decrease illegal tagging because taggers respect urban artist (sic).” The EOBC report goes on to note, “young people resort back to illegal tagging because they don’t get paid for their murals.” Curiously, Houston has also questioned the Oakland City Council’s decision to set aside $50,000 per Council District for mural projects which specifically target tag-related blight; it’s unclear why the EOBC hasn’t made a formal proposal for murals under this fund, given its own statements that murals do indeed deter vandalism, and funding muralists decreases tag recidivism. 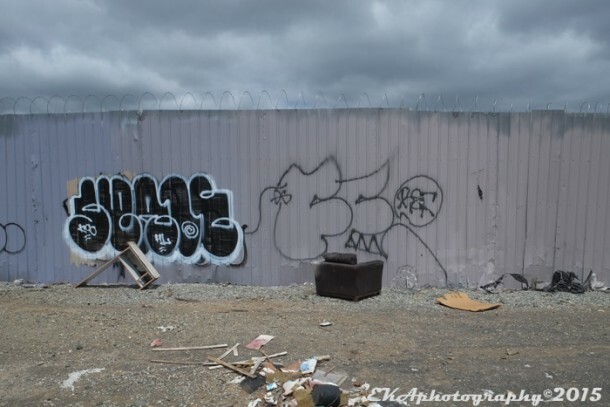 In one video, Houston stands in front of “Graffiti Cove,” a free wall spared from the EOBC’s buffing of the San Leandro corridor in East Oakland (which cost zero in artist fees, since none of the work was legally commissioned or subject to community or administrative oversight) and claims that the EOBC has discovered a way to cut tagging by 75% (more on this later). Houston also seems unaware of any abatement efforts in Oakland prior to the forming of the EOBC (which coincided with his 2014 Mayoral run). Though he’s made graffiti removal his pet project, he appears not to have followed the policy debate over the issue prior to his fairly recent involvement. He doesn’t say, for instance, that private abatement programs in Oakland, such as the one run by Men of Valor Training Academy in 2011, which was funded by the city’s now-defunct redevelopment agency, not only have had uneven results—essentially creating plenty of blank canvasses for the city’s most-active taggers—but proved unsustainable on their own. Or that Oakland public works staff are on record as saying the approximately $1 million per year spent by the city to buff public property is ineffective and the city doesn’t know how to prevent the graffiti epidemic. It’s clearly not as simple as “buying a sprayer and a couple hundreds of gallons of paint,” as one commenter speculated on Houston supporter Olive Balkhi’s Facebook page. Yet Houston claims to have the solution: a graffiti removal pilot program he calls “Operation Clean Sweep” which “brought together Oakland Public Works, BART, Union Pacific, Private Stakeholders and Volunteers” to eradicate tagging and illegal dumping along the San Leandro corridor in East Oakland. According to the group’s website, “The EOBC kept this area graffiti-free for nine months,” before ending its pilot program in February 2015. A few sentences later, the website claim is revised to “95% effective” (in Houston’s latest video, the figure is further downgraded to the 75% figure mentioned earlier). Whatever the actual success rate, EOBC hasn’t yet published any of its findings. Requests to Houston for copies of the study weren’t answered. Nor did Houston respond to a request for more information about “Erase & Buff Field Data & Tracking Systems,” which the EOBC claims is a new abatement methodology which somehow succeeds where so many other similar programs have failed. CRP investigators did turn up a KRON-TV segment which explains the “Erase & Buff” system: it’s a phone app, which will only be made available to law enforcement and utility and municipal employees, which allows users to take photos of vandalism or dumping, with GPS coordinates, and file police reports. The app also calculates square footage of the affected area and estimates cleanup costs, although it’s unclear how those figures are calculated. In the following YouTube video, the Erase & Buff app is explained at 3:19. 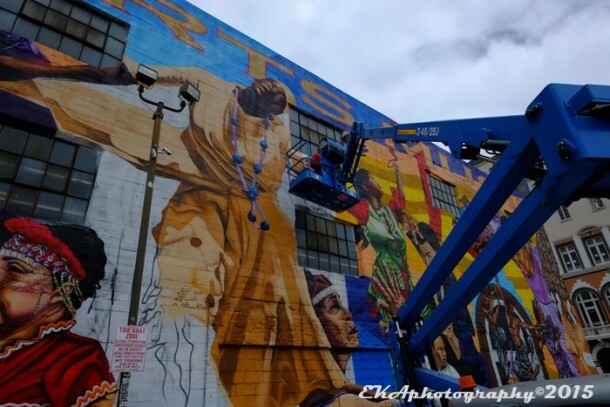 Besides the potential problem of assigning inflated cleanup cost figures, “Erase & Buff” could theoretically exacerbate existing instances of legal, sanctioned murals being buffed and legitimate artists being falsely identified as vandals, since Oakland does not have a current mural registry program. 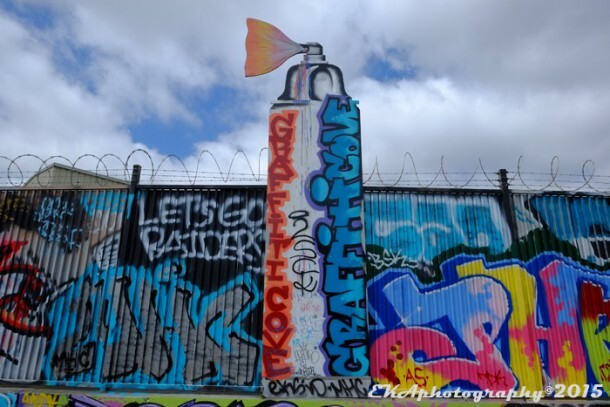 And, since graffiti has been identified as low-priority by the Oakland Police Department, there’s no guarantee filing a police report will result in an investigation, much less an arrest and conviction. 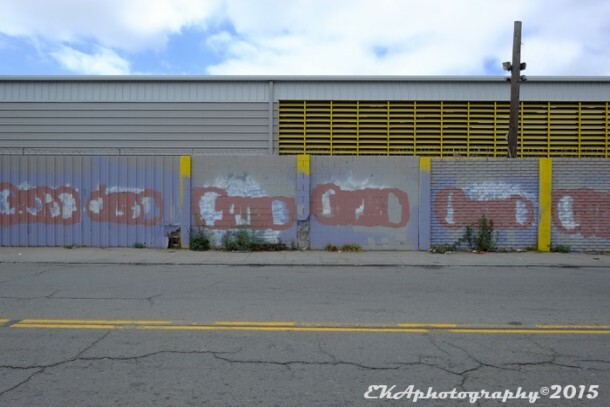 A tagger would still have to be caught in the act for the City Attorney to pursue a civil case, and only a successful civil case will result in a payout to the victim’s compensation fund. To date, not a single case has been brought. “Erase & Buff” could conceivably allow police to build more extensive cases against taggers, further criminalizing youth attempting to express themselves creatively but lacking legitimate platforms to do so. But inflated damage estimates and the trebling of penalties in a civil suit could result in property liens against families, resulting in displacement of low-income homeowners and accelerating gentrification. In any event, such punitive-oriented measures go against Houston’s own statements to EOBC in January 2014 calling for “positive” engagement with youth artists. 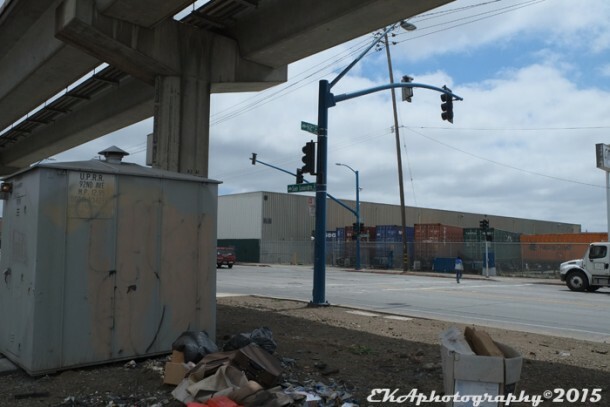 There are also many problematic aspects to “Operation Clean Sweep.” An inspection of the EOBC’s project area by CRP’s investigative unit revealed that, three months after the pilot program was completed, some of the walls of the San Leandro corridor are indeed cleaner than they have been in years – for now. But even with the claimed 75% success rate for a portion of a single city street, there’s no evidence that taggers didn’t simply move elsewhere. Questions of selective enforcement are also raised by the fact that the project area includes Union Pacific tracks. The railroad reportedly spends $500,000 annually for graffiti cleanup, but it’s unlikely they would fund an sustained abatement effort in areas outside their jurisdiction. The same goes for BART, CalTrans, and PG&E. Which means that it would either take an expanded volunteer labor force, or extra public investment into private abatement over and above what is currently spent, to significantly impact tagging outside of a limited project area, and even then, only offer a temporary solution. CRP also found numerous evidence of newly-painted tags, as well as illegal dumping, throughout the project area. The abated walls were cleanest south of 85th St, toward San Leandro. But the closer to the Coliseum BART, the more evidence there was of tag recidivism. The abatement effort didn’t appear to mitigate tagging on surrounding streets, and may have actually led to an increase in vandalism and dumping on adjacent areas. Such findings would be consistent with our position that abatement efforts are unsustainable over time, and require constant rebuffing to maintain, which can be an expensive proposition. CRP also found a rather ironic situation which undermines Houston’s claims that murals are not effective deterrents: a mural on the walls of the AB&I Foundry–which is not only within the EOBC project area, but across the street from the “Graffiti Cove” location–was 100% unscathed by tagging, and required no abatement whatsoever. Given its proximity, it’s unlikely Houston could have been unaware of the mural, painted in 2013, prior to the forming of the EOBC; however, the art piece’s resilience suggests that had murals been painted along the San Leandro corridor instead of buffing walls, those walls would have required far less, or even zero, continual maintenance. The bottom of the EOBC’s website contains a sales pitch “to implement Erase & Buff in your city or agency,” which suggests that Houston’s real agenda isn’t to support restorative justice-oriented youth programs, as he once claimed. The EOBC’s March 2014 minutes ask, “how can we get funding?? ?,” which can be taken as a tacit admission that their efforts are currently unsustainable. Indeed, it seems likely Houston’s goal is to divert public money earmarked for murals toward funding an abatement effort previously reliant on volunteer labor and corporate investment, and to develop a revenue stream for himself as a self-styled graffiti consultant. It’s also likely Houston is seeking the help of Councilmembers Brooks and Reid, who have yet to allocate any of their abatement mural funds, and may have illegally steered lucrative city contracts to Houston’s firm in the past. The fact that Houston and the EOBC haven’t made any of the data of their case study, nor the methodology employed, publicly available makes it difficult to objectively assess the claimed results, or to quantify their legitimacy (or lack thereof). Moreover, Houston’s claims effectively contradict all known empirical and anecdotal evidence that simply buffing walls is not a cost-efficient abatement strategy from a long term perspective. In actuality, the victim’s fund mentioned in the ordinance was supposed to come from civil prosecution of vandals, as outlined in sections 8.10.5.20 a), 8.10.600, and 8.10.620 of the ordinance and is entirely separate from the set-aside for abatement murals, which was a City Council action that is not even mentioned in the ordinance. In fact, the City Council’s approval of the Public Safety Committee’s 2012 recommendation to authorize an abatement mural fund came about due to the strong advocacy by a coalition of public art advocates, muralists, and arts-based organizations that an alternative abatement strategy, which also incorporated restorative justice provisions, was needed. 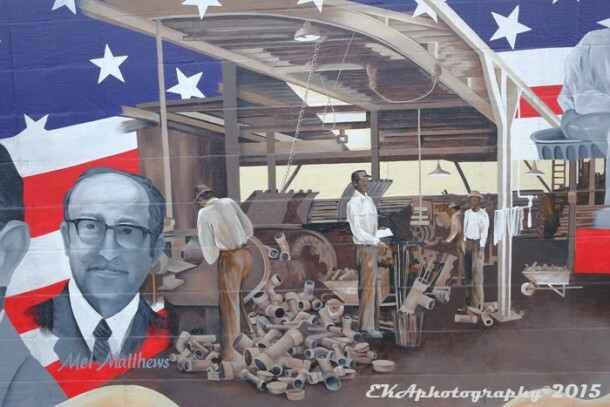 It’s worth noting that the EOBC didn’t exist at that time; indeed, Houston seems to have only found out about the mural set-aside this past April, when an Oakland Tribune article noted only $14,000 of the total $400,000 had been allocated for mural projects. Case studies such as San Jose’s, where an anti-graffiti campaign received much fanfare (and built a lucrative consulting career for its main proponent) but ultimately proved unsustainable, should be warning signs for cities like Oakland. 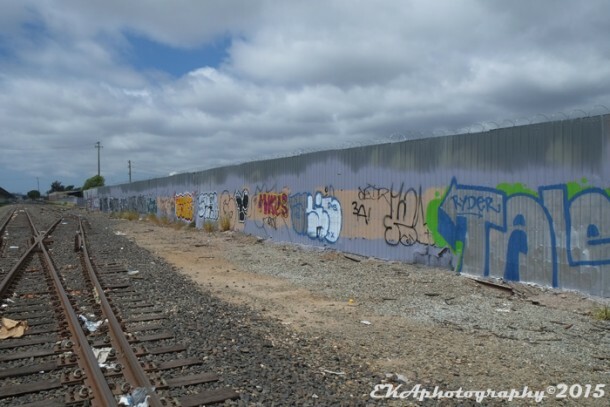 So should the report that the private abatement firm tasked with eradicating tagging in San Jose had been caught overcharging the city, as well as the fact that San Jose disbanded its Graffiti Task Force because officers were needed for more high-priority crimes. That has implications for Oakland, which is currently about 200 officers short of recommended levels of police staffing. 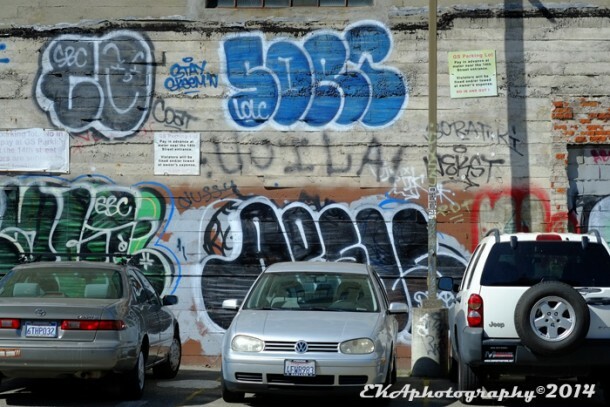 It’s difficult to make a rational argument that understaffed OPD officers should investigate graffiti instead of clearing the city’s unsolved homicide cases (OPD’s clearance rates are less than half of the statewide average, as KQED reported). With that being the case, it would be fiscally irresponsible for the city to throw any more money down the abatement-industrial complex black hole without first implementing alternate solutions. If the city wanted to, it could generate more abatement funds by fining banks who own foreclosed properties, along with public transit agencies, just as it fines business owners victimized by taggers on a regular basis. If developers and industrial businesses want to fund abatement efforts on their own dime, or organize volunteer beautification efforts, that’s fine. But it simply doesn’t make sense to divert money earmarked for murals when only 3.5% of that money has been spent. A more sound policy would be to spend the remaining 96.5% of the mural fund for its intended purpose and compare the results to abatement programs. At this point, the city of Oakland has nothing to lose, and everything to gain, by increasing its investment in murals.